The day before the Clambake, it rained all day and night. That was the day on which the chapter's new name became effective. Were the powers that be in the heavens above crying over the name change? One wonders! 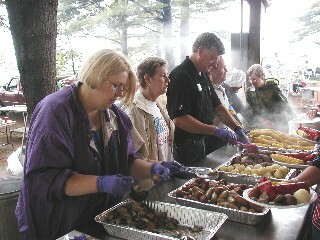 Although on the day of the Chapter's Annual Clambake, August 2, 2003, it was overcast and threatening, the rain held off. Once again the Annual Clambake was held on Jamaica Island at the Portsmouth Naval Shipyard. Most of the 399 members, family and guests who had signed up took a chance and enjoyed another outstanding Clambake — good company and our traditional feast of clam chowder, lobster, steak, wurst, corn-on-the-cob, potatoes, onions and watermelon. Our new Congressman, Jeb Bradley, joined us for his first official Clambake. RADM Ed Nelson, USCG (Ret. ), a national director of MOAA, presented the chapter with two awards from the national headquarters of MOAA. LCDR Paul Sova, USCG (Ret. ), a national director of MOAA, and his wife Terry; LCDR Ken Nilsson, USN (Ret. ), a regional vice president of the NY Council of MOAA, and his wife June; and CAPT Kevin McCoy, USN, the Shipyard Commander also joined us. Again this year we extended an invitation to our neighbors from Vermont in the Green Mountain Chapter to join us. Sixteen members and guests trekked across New Hampshire to attend the Clambake. Because they had such a good time last year, the Ft. Devens Chapter asked if they could come back again. Twenty-one MOAA cousins from "south of the border" joined the best chapter of MOAA at our Clambake. As they did last year, MOAA sent out letters to those national members residing in New Hampshire who are not members of the chapter inviting them to attend and have a chance to talk with RADM Nelson about important issues relevant to the retired community. Eight national members and guests attended, and we even got five to join the chapter! We had one new chapter member in attendance for his first MOAA-NH event - Stephen Rufo of Northfield. One of the benefits of the Clambake, other than to enjoy a great home cooked barbecue, is to support the Chapter's Scholarship Loan Fund. This locally run program helps children and grandchildren of the New Hampshire Chapter members with college expenses by awarding interest free loans of $1500.00 per academic year. This year fourteen students will receive loans. The Clambake raised $3006.50 toward a goal of $5000.00 for this year. Thank you to all who contributed! !